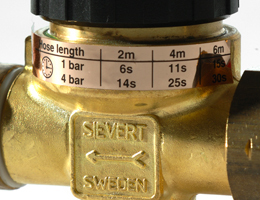 Sievert regulators are made to ensure high quality and long service life while delivering precise pressure. Certain Pro 86/88 burners, such as cyclone burners and most Promatic burners, require a steady pressure of 2 bar to ensure best performance. Other burners can also operate under high pressure, but it is an advantage to be able to stabilize and obtain the same pressure on both warm and cold days. The diagram shows how the pressure in an LP-gas cylinder varies with temperature. If the gas output is high, the gas cylinder will be cooled down and the pressure will drop. Why use a hose failure valve? A hose failure valve improves safety by cutting off gas flow in case of a hose rupture or gas leak. The hose connection rotates freely on the valve housing, which helps prevent the hose from becoming tangled. Sievert hose failure valves are supplied separately (3054) or integrated in regulators (3063, 3083, 3092 and 3093). Why use Leak Test System (LTS)? The LTS valve is designed to detect minor leaks. Before starting work, the operator can check for leaks in the system using the LTS valve. LTS valves are especially recommended in poorly ventilated areas and when working below ground. A regulator with LTS is always combined with a hose failure valve to reduce the risk of major leaks.